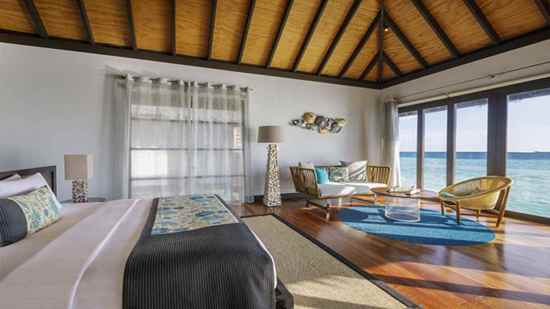 Velassaru redefines luxury Maldives holidays by offering stunning suites and villas designed to the highest level. Rich dark wood against contemporary furnishings, indulgent bathrooms overlooking the sea and private bedrooms ensuring maximum comfort all combine with fantastic resort services. The most exquisite cuisine is served at Velassaru either directly on the beach for romantic evening meals or in stylish restaurants and pool bars. There are sports and water sports with diving and snorkelling being the major attraction of these crystal clear waters and of course pampering spa services will finish off the experience. The resort enjoys a secluded location on a tropical island, and boasts all the amenities you could possibly need onsite. 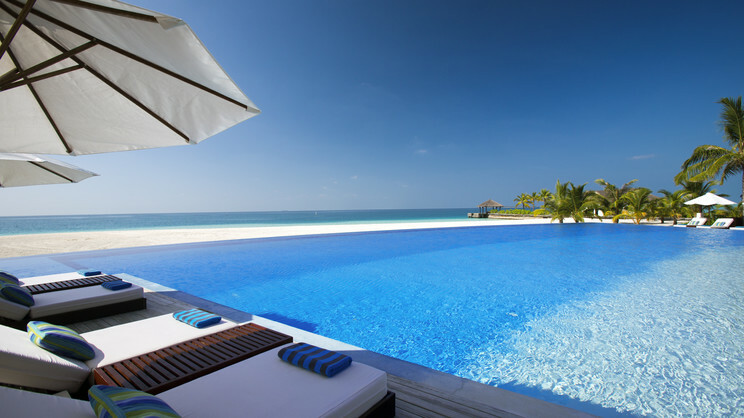 Velana International Airport is approximately 25 minutes away from the Velassaru Maldives Resort via speedboat. 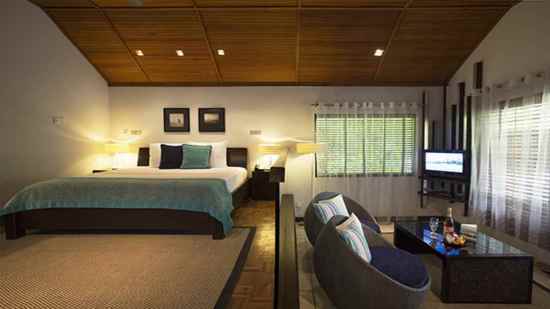 Stylish and modern, these garden bungalows are tranquil and serene with designer amenities and in-room entertainment. 70 square metres features a garden bathroom with rain shower plus an indoor shower. There is an open terrace, split-level accommodation for added privacy and plenty of luxury services. 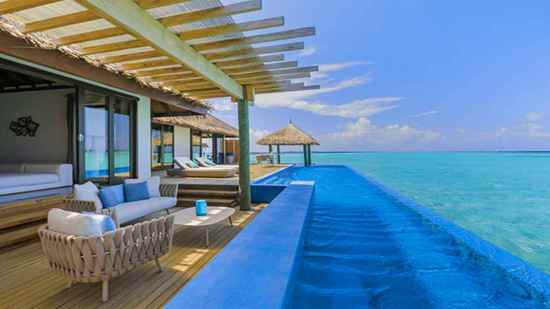 A generous villa with stunning ocean views, this features a private courtyard with outdoor rain shower, a veranda complete with daybed and all of the standard services amidst an elegant and contemporary décor. 116 square metres of decadent space allows for a private courtyard with garden shower, outdoor soaking tub, and a private plunge pool and veranda with daybed. Stunning views of the ocean against a natural décor of stone and teak wood with a contemporary finish offers a tranquil ambience perfect for luxury getaways. Views of the turquoise lagoon can be enjoyed from floor-to-ceiling doors that lead onto a private deck featuring a private pool. 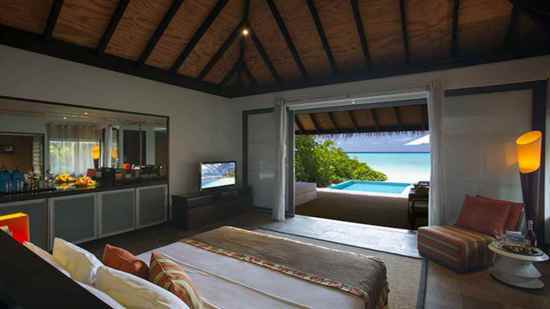 A peaceful retreat, the water bungalow is an ideal choice for families with older children. A generous 112 square metres incorporates a private terrace perched over the lagoon, a large king-bedroom, free-standing bathtub with room for two and a full sea-facing wall that opens on to the terrace. Sunsets are magical from this romantic spot in your private villa; it’s an unforgettable experience complimented by room service and personal wine chiller for your favourite tipple. 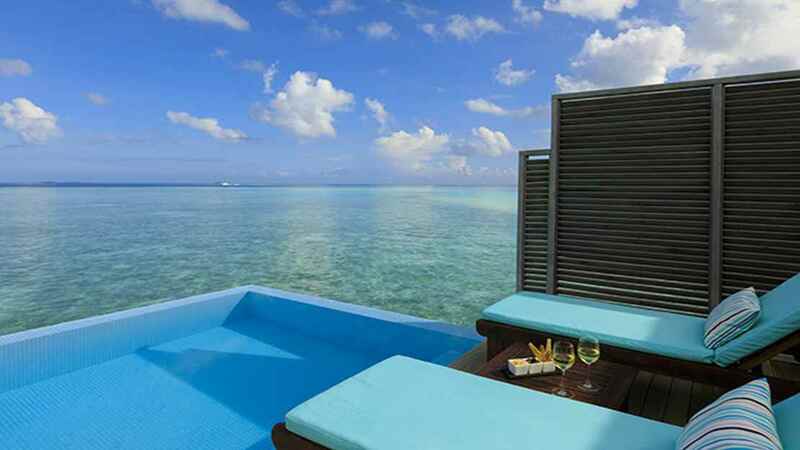 This accommodation incorporates standard water villa features but with a generous private infinity pool overlooking the beautifully clear ocean. 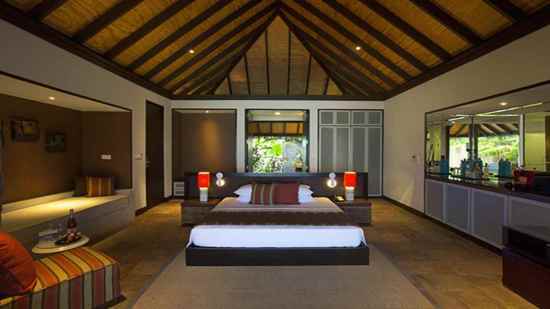 A tropical retreat, pool villa offers an impressive space that spans 175 square metres. 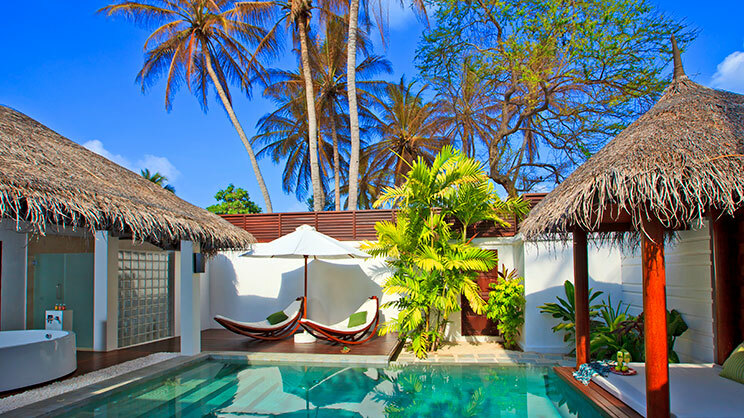 Relax by an oversized plunge pool on the decadent terrace or under the thatched gazebo. Sink into the plush bed complete with branded linen and pillow menu in the split-level bedroom with generous en-suite and simply enjoy all of the luxuries such as courtyard garden showers and poolside dining. A spectacular hideaway, this 270 square metre suite sits above the turquoise water and offers direct lagoon access, perfect for snorkelling in addition to an over-sized infinity pool and private sundeck. A 24-hour personal butler service, home theatre system, poolside dining options and thatched gazebo alongside the infinity pool ensures plenty of space for families. Please note we do not advise bookings in the over water suite for families with children below 12 years. 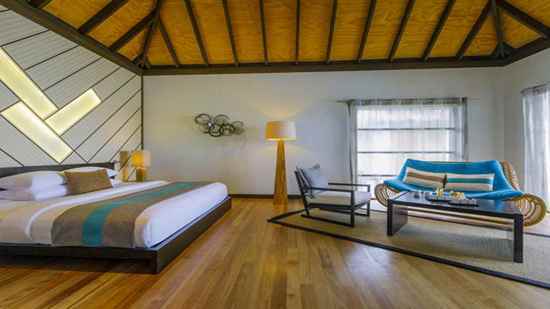 The suite also features a bar area with stools, services such as dual-door mini fridge, double vanities and bathroom amenities, ice machine, pillow menu and use of snorkelling equipment. World-class dining is on offer at the luxury resort Velassaru and with a choice of venues and intimate dining options, world cuisine never tasted so exquisite. Creative chefs cook with flair at this open kitchen venue serving sushi and sashimi, seared salmon and vibrant dishes with a twist. Enjoy delicious breakfasts, lunches and dinners at this elegant restaurant which serves succulent meats, fresh seafood and exotic creations via an international buffet theme. Etesian combines the wonderful flavours of the Med and serves them in a range of intimate settings alfresco on the terrace, with in a stylish restaurant or directly on the beach by candlelight. Start the day here with local fruits and fresh juices and integrated international cuisine.